This is based on a salad I met and fell in love with in Avoca last summer. I think their salad used broad beans but for me garden peas are much more readily available. It is a very simple but fresh, light salad that everyone seems to love… even some who claim not to like peas. Quantities below are a suggestion only for a medium sized bowl – they are of course totally flexible depending on your preference. 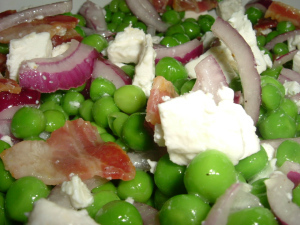 Place peas in a pan and cover with boiling water, bring to the boil and cook for approx. 3 minutes. Drain peas in to a colander and rinse under cold running water until fully cooled – this will keep the peas a nice vibrant green. Allow peas to drain fully. Fry the pancetta or rashers in a pan then remove on to kitchen paper and allow to cool, then slice roughly into half inch pieces. 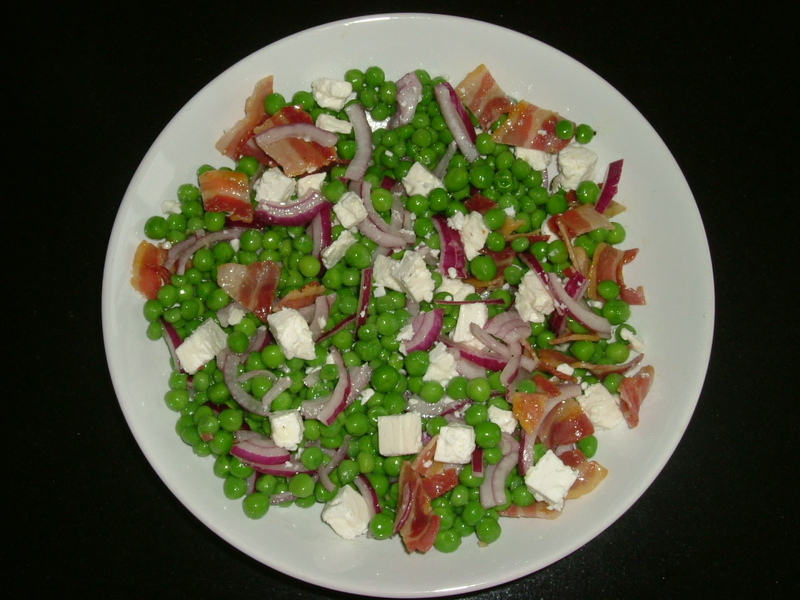 Mix the peas, red onion and bacon in your serving bowl and drizzle lightly with french dressing, then add the feta and mix lightly to distribute evenly. That looks gorgeous…defo going on the list of summer food to try! I’d say it’s lovely with a barbie too, all the fresh flavours would be a nice contrast to the meat!